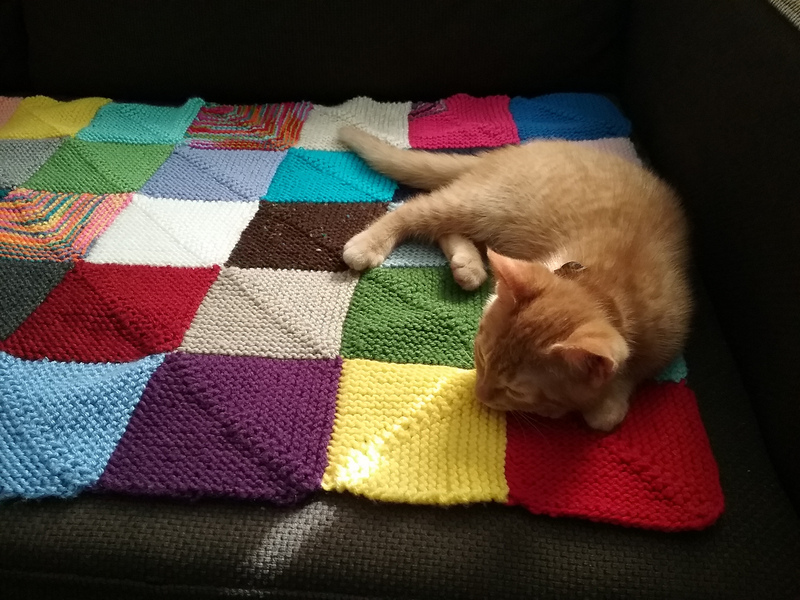 Remember that scrap blanket I had mentioned over a year ago? I finished it last week! I am happy with how it came out. I really enjoyed knitting it and seeing it grow. It really was the ideal TV knitting. I enjoyed making it so much I am kinda bummed I don’t have anymore to knit. I might make another one some day, just smaller and I would stick to one color (a ombre effect would be super keen!). I’d love to make a grey scale one as I think it would stunning in neutrals but I do not knit with black yarn if I can help it. My eyes are getting to old for that. I have yet to actually measure it or count how many squares there. Pattern is Memory Blanket by TikkiKnits (Ravelry link). I also used her blog post here to help me figure out how to do each square in the beginning. Worried about sewing it all up? There are is no sewing! You knit each square as you go along. You only have ends to weave in. Isn’t that great? On with the photos. I know that’s what everyone wants. Clicking on first photo will bring you to my Rav project page. This is probably my favourite photo of it. These days you can find me mostly on Instagram . Cole and Clem have their own IG as well! Okay, one more picture. :) Doesn’t it look so cozy? I think it looks like someone’s grandma’s blanket in the best way. Very hygge like that.